i love it when my house smells like cinnamon. whether it’s an apple pie or apple crisp, cinnamon rolls, or overnight monkey bread, there is just something warm and comforting about the smell of cinnamon wafting through the air. it smells like home. since cinnamon is typically is a fall scent (though i still bake with it year-round!) and it pairs perfectly with apples – a fall harvest – we always make apple crisp this time of year. the past couple of years, though, i’ve turned to making apple crisp with another fall staple :: cranberries! 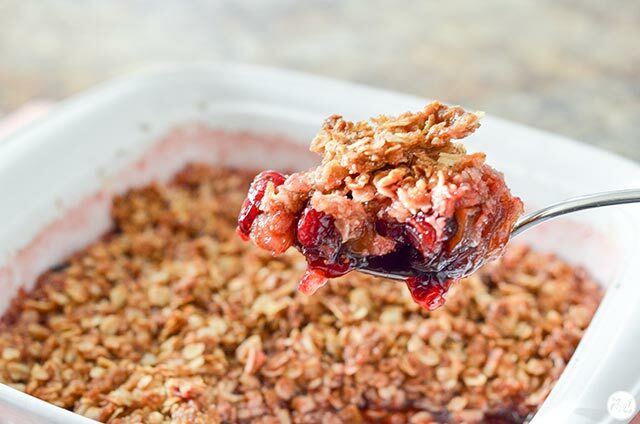 cranberries are definitely tart, but in this cranberry apple crisp they get sweetened up with the sugar and the natural sweetness of the apples so they add a lot of great not-super-tart flavor to this comforting dessert. they also freeze really well, so you can stash some in your freezer while they’re in season to enjoy during the rest of the cold winter months. there really aren’t a whole lot of ingredients needed to make this home-y dessert and it’s really fast and easy to put together, which means it is my kind of recipe! 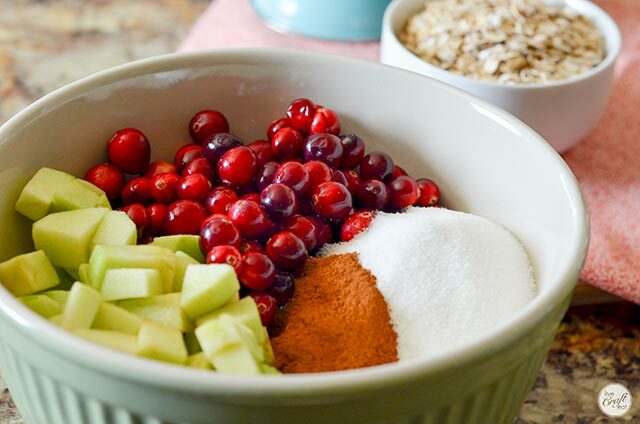 just cranberries, granny smith apples, lemon juice, oats, white sugar, brown sugar, cinnamon, and salt, and butter. first, we need to make the fruit filling. 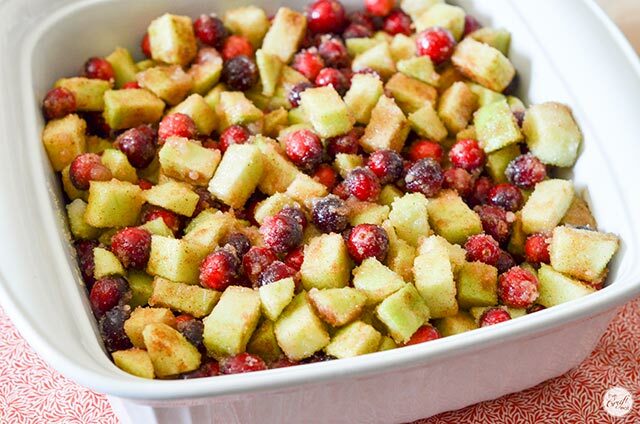 combine the peeled, diced apples with the cranberries, sugar, and cinnamon. once they’re all combined, add the lemon juice and stir it all together. once they’re all mixed together, toss them into a greased 8×8- or 9×9-inch baking dish. mmm. looks (and smells!) good already. ok, so if that part wasn’t hard enough, (haha) let’s move on to the topping…. throw the oats, brown sugar, and salt into a large bowl and stir to combine. then cut up the cold butter into small-ish pieces. using a pastry cutter (or two dinner knives, or even your hands!) 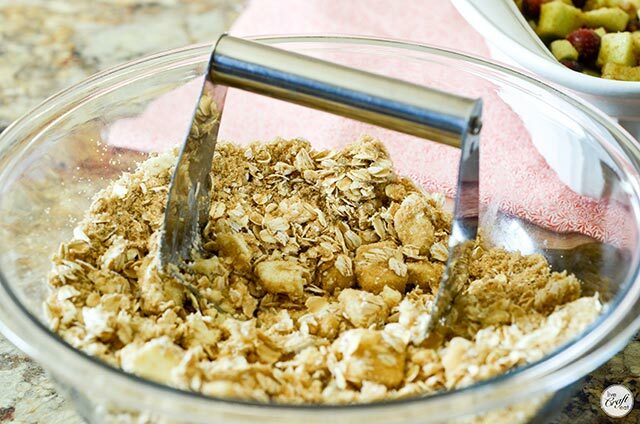 cut the butter into the oat mixture until the whole thing starts to resemble coarse crumbs. cover the cranberry apple filling with the crisp topping. bake at 350 degrees for 1 hour. your house is sure to start smelling real good really soon! when it’s done it will have sunken a bit and you’ll be able to see the pinkish color that the cranberries have given the dessert. so pretty! 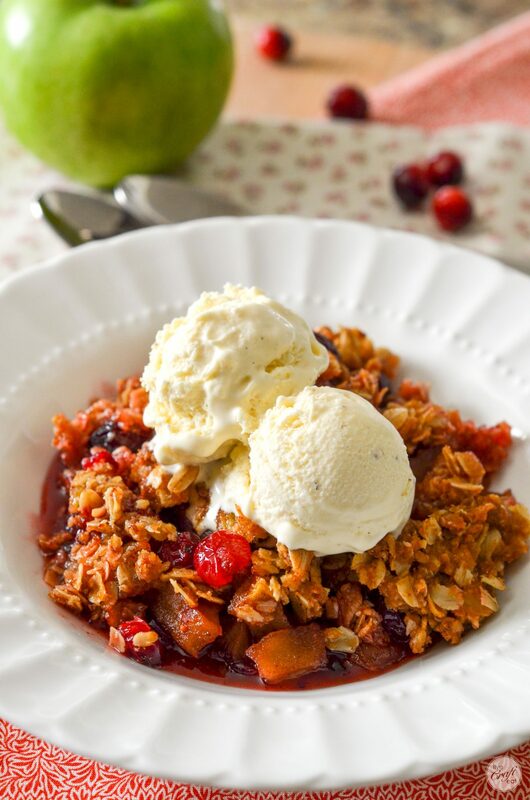 grab a spoon and see for yourself just how beautiful this cranberry apple crisp really is! 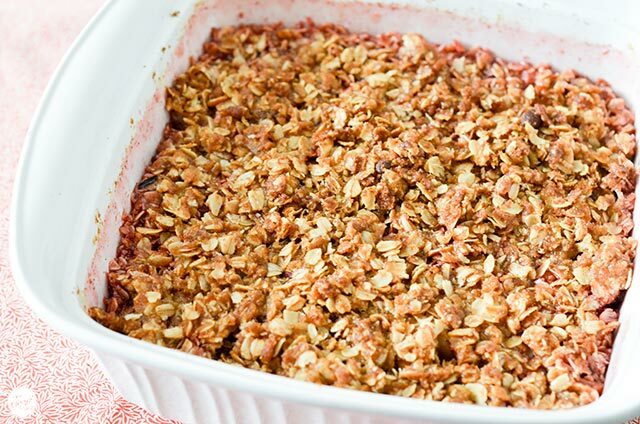 you can see the cranberries have softened quite a bit along with the apples, and the topping is crisp…which is just what you want with a cranberry apple crisp. grab a big helping and serve it warm with vanilla ice cream. oh my goodness, this is heaven, i’m pretty sure. not only does it look beautiful but it tastes amazing. 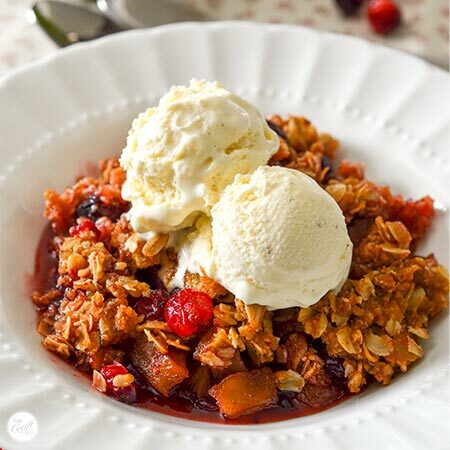 i just want to grab a blanket right now and enjoy a big bowl of this cranberry apple crisp. since the weather is getting cooler and i have everything i already need to make this (not to mention it is so easy and takes almost no time at all to prep)…that just might happen! happy fall everyone! i hope you enjoy this wonderful dessert. print the recipe below! 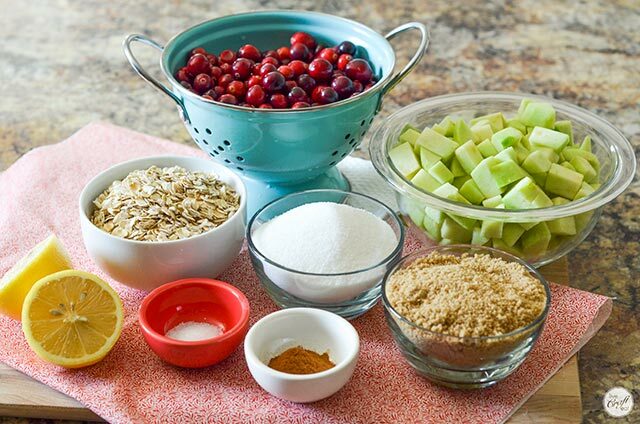 in a large bowl, combine the fruit filling ingredients. place into a greased 8x8- or 9x9-inch baking dish. set aside. 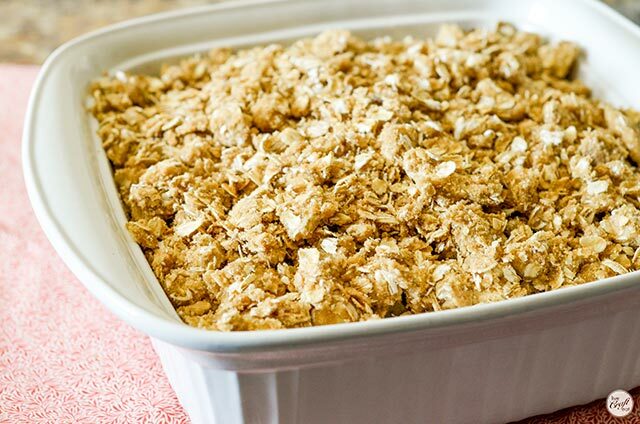 in another large bowl, combine the ingredients for the topping: oats, brown sugar, and salt. put in butter. sprinkle topping mixture over fruit mixture. bake at 350 degrees for 1 hour. serve warm with vanilla ice cream. enjoy!